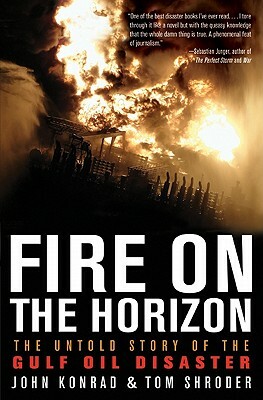 Blending exclusive first-person interviews and penetrating investigative reporting, oil rig captain John Konrad and veteran Washington Post writer Tom Shroder give the definitive, white-knuckled account of the Deepwater Horizon explosion—as well as a riveting insider’s view of the byzantine culture of offshore drilling that made the disaster inevitable. As the world continues to cope with the oil spill’s grim aftermath—with environmental and economic consequences all the more dire in a region still rebuilding from Hurricane Katrina—Konrad and Schroder’s real-time account of the disaster shows us just where things went wrong, and points the way to a safer future for us all. Tom Shroder was an editor and writer at The Washington Post from 1999 to 2009. Under his stewardship, The Washington Post Magazine won the Pulitzer Prize for feature writing in both 2008 and 2010. He is the author of the nonfiction bestseller Old Souls. He lives in Vienna, Virginia. John Konrad is a veteran oil rig captain; a former employee of the Deepwater Horizon's owner, Transocean; and the founder of the world's leading maritime blog, gCaptain.com. A graduate of SUNY Maritime College, he lives in Morro Bay, California.